2012 marks the 20th anniversary of Clint Eastwood's landmark Unforgiven...and even if you've never watched the film, you've undoubtedly seen it name-checked on promotional artwork for just about every Western made since 1992. Eastwood's career behind the camera has maintained an incredible amount of momentum since winning that year's Oscar for Best Picture, but many feel that Unforgiven is the best thing he's ever directed. I'd be inclined to agree, but this is more than just a well-crafted picture: it also has a fantastic story, strong performances, terrific pacing and a truly authentic atmosphere. The last time I saw Unforgiven was shortly after the excellent 2002 Collector's Edition surfaced; not surprisingly, it held up quite well and continues to hold up. The film's meta-commentary on Clint Eastwood's own career is just icing on the cake...but even on the surface, it's just a great story told exceptionally well. William Munny (Eastwood) is a former thief and murderer; now he's a pig farmer in Kansas with two children, a dead wife and a lifetime's worth of guilt. Munny's old partner Ned (Morgan Freeman) is also living a reformed life, but all that changes when they hear about a $1,000 reward for killing two cowboys who brutally attacked and permanently disfigured a young prostitute in Big Whiskey, Wyoming. Together with a brash young gunslinger, The Schofield Kid (Jaimz Woolvett), they head northwest in search of the money that will hopefully change their lives for the better. Unfortunately, their lives are changed drastically and for the worse. Munny already knows that he's not the same man: his wife cured him of all the ills in life and her stubborn memory keeps him fixed on the straight and narrow. Ned shares the sentiment, but it takes him a little longer to realize that killing isn't as easy as it once was. The Schofield Kid, oddly enough, is almost the polar opposite: he's all talk and wants to have a legacy of violence like the two older men, but the brutal encounters they face eventually wear down his tough exterior. The film divides up its 131-minute running time exceptionally well, frequently shifting focus between our three outlaws, corrupt Big Whiskey sheriff "Little" Bill Daggett (Gene Hackman), the frightened but vengeful prostitutes and more. Unforgiven builds slowly to an absolute scorcher of a third act, where all Hell literally breaks loose and brings the Devil along for the ride. During the last few decades, Hollywood has produced a number of great Westerns, but Unforgiven is easily the best of the lot. Here's where the good news ends: to "celebrate" it's 20th Anniversary, Warner Bros. has shameless re-released a Blu-Ray that was even weak by 2006 standards. Granted, this one-disc release is housed in a fancy Digibook and looks great on the shelf, but that's about it. Really, all this Blu-Ray needed was a new encoding, lossless audio and maybe a new retrospective featurette or two and it would've been pretty darn tempting. As it stands, this sorry excuse for a double-dip should be avoided entirely...and even worse, it promises something it doesn't deliver. See you in five years? Identical to the original Blu-Ray and HD DVD releases from 2006, this 1080p transfer of Unforgiven is good but shows room for improvement. To be fair, much of the film is shrouded in blackness and shadow---especially during the third act---and unavoidably looks a little flat, but it's partially a source material issue. Sunny outdoor scenes are suitably crisp and well-defined, representing the film's natural color palette quite well. Compression artifacts and other digital eyesores pop up occasionally, due to the older encoding process used on this dual-layered disc. Simply put, it's a decent presentation of a film that's never looked perfect, but a modest amount of tightening could've easily made this a definitive effort. NOTE: Astonishingly enough, the packaging hints that Unforgiven has been "newly remastered", but it obviously has not. This certainly borders on false advertisement and, in this reviewer's opinion, is grounds for a recall. Double dips are one thing, but misrepresentation is another matter entirely. Most people cried foul when the original high-def releases arrived with lossy audio tracks...and once again, the problem hasn't been corrected. We're stuck with a plain-wrap Dolby Digital 5.1 mix here (along with French and Spanish 2.0 dubs), which creates a passable experience and nothing more. The film's understated score is crisp and dialogue is easy to understand, but the lack of lossless audio (heck, even a DTS track) means that we don't get the punch, fullness and dynamic range that we're used to. Again, this is truly a missed opportunity, and it probably means we won't see anything better for at least five years. Just for the record, optional subtitles are offered in English, French and Spanish. Seen above, this single-disc release is housed in a handsome matte-finish Digibook with 58 pages of behind-the-scenes photos, essays, cast bios, quotes and much more. It's a quality packaging job that, unfortunately, is the only difference between this release and the last one. The dated menu designs are thrown together in typical "2006 Warner Bros. release" style, boasting crude layouts and a hard-to-read wall of bonus features. To summarize: book looks great, movie looks good, menus look like crap. Sure, some new extras would've been nice, but there's still a fair amount to dig through here. All of these are recycled from the previous high-def releases (and, of course, the 2002 Collector's Edition DVD) and include an Audio Commentary with Eastwood biographer Richard Schickel, four Documentaries of various quality ("Eastwood and Company", "All on Accounta' Pullin' a Trigger", "Eastwood...a Star" and "Eastwood on Eastwood") and a Bonus Episode of Maverick ("Dual at Sundown") featuring a young Clint in action. Not surprisingly, everything's presented in standard-def and does not include optional subtitles. 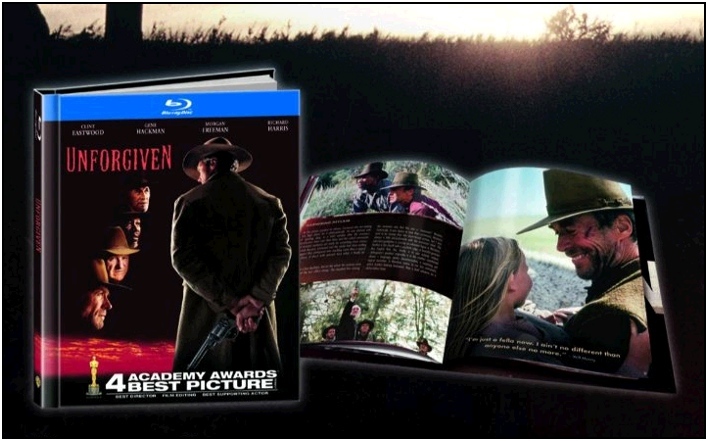 Unforgiven is and always will be a great movie, but this "20th Anniversary Edition" doesn't measure up by a long shot. It's essentially a lazy rehash of the 2006 release, complete with a slightly outdated transfer, lossy Dolby Digital audio and the same extras as the 2002 Collector's Edition DVD. Fancy packaging aside, this is the worst kind of double-dip: one that could've been fantastic with a small amount of effort. Warner Bros. also earns negative points for hinting at a "new restoration" that doesn't exist....and to be honest, such a misleading type of release is only deserving of one rating in my book. Skip It. NOTE: The above images were obtained from promotional outlets and do not represent Blu-Ray's native 1080p resolution. Randy Miller III is an affable office monkey based in Harrisburg, PA. He also does freelance graphic design projects, teaches art classes and runs a website or two in his spare time. He also enjoys slacking off, lame jokes and writing stuff in third person.